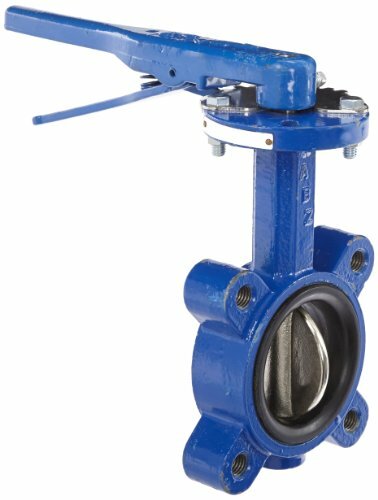 Threaded lug style butterfly valve. PTFE bushing. Buna-N seal and stem seals. Stainless steel top and bottom stems. The number of holes on the valve should match the number of holes for the specific flange size. Aluminum bronze disc, ASTM B148, ALY.954. Ductile iron body, ASTM A536. For use between two 150 lbs flanges. Will lock "open" or "closed". Buna-N liner. Rated to 200 psi pressure at ambient temperature (70 degree F). Size: 3". Not recommended for steam service.